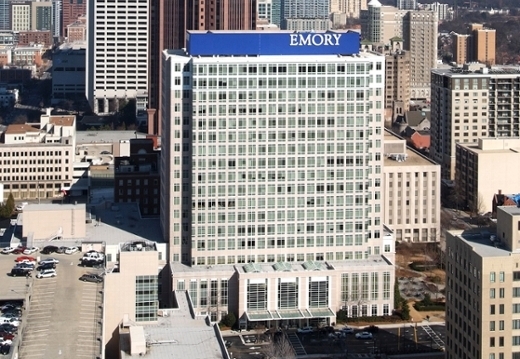 Emory researchers will install a new electronic hand hygiene monitoring system at two of its hospitals, Emory University Hospital Midtown (pictured) and Emory Johns Creeks Hospital, to look at ways to improve hand hygiene, long considered the cornerstone of preventing infections in hospitalized patients. Emory University School of Medicine has been awarded a three-year, $2.2 million grant from the Centers for Disease Control and Prevention (CDC), making Emory a new member of its Prevention Epicenters Program. The program, which began in 1997, focuses on infection control and prevention research in health care facilities. Emory will collaborate with Georgia Institute of Technology (Georgia Tech) and Georgia State University on the grant, creating the Prevention Epicenter of Emory and Atlanta Consortium Hospitals or PEACH. Emory and five other U.S. academic medical centers join five existing centers to accelerate health care innovations by discovering new methods to protect patients and health care workers from highly infectious diseases. The new centers will focus on the prevention of Ebola and more common infections that are transmitted like Ebola. "The goal of PEACH is to translate microbiological, epidemiological and technological discoveries into new strategies to better protect the health and safety of physicians, nurses and patients from high-risk pathogens and communicable diseases," says Jesse T. Jacob, MD, associate professor of medicine in the Division of Infectious Diseases, Department of Medicine, Emory University School of Medicine, and lead principal investigator (PI) of this grant. "Their work will include rapid prototyping in simulation labs, quantifying and visualizing spatial metrics using special analytic tools, and using novel technology to implement programs to enhance hand hygiene compliance." Emory investigators will work with Georgia State microbiologists to assess the transfer of a marker for Ebola and other pathogens when removing personal protective equipment (PPE) and look at steps in the process where errors could occur. The group will visit Georgia's five state-designated Ebola treatment centers and work with healthcare workers at those sites to assess opportunities to improve safety for healthcare workers. The Georgia State PI is Lisa Casanova, PhD. Emory leads are Colleen Kraft, MD; Susan Ray, MD; and Andi Shane, MD. Emory and Georgia Tech researchers will study how the physical environment can make it safer for health care workers to don (put on) and doff (take off) PPE required for working with patients infected by Ebola virus disease and other pathogens with transmission mechanisms similar to Ebola. They will use realistic simulations to understand how healthcare workers use PPE at the SimTigrate Design Lab in Georgia Tech's College of Architecture. Also, Georgia Tech's human factors group from the School of Psychology will focus on behavioral interactions with PPE to identify high-risk components of the suits or of the process used to don or doff them. Georgia Tech PIs are Craig Zimring, PhD, and Frank Durso, PhD. Jacob is the Emory lead. Emory researchers will install a new electronic hand hygiene monitoring system at two of its hospitals, Emory University Hospital Midtown and Emory Johns Creeks Hospital, to look at ways to improve hand hygiene, long considered the cornerstone of preventing infections in hospitalized patients. The system will be used to compare the effectiveness of different methods of providing feedback to health care workers on hand hygiene compliance. Emory PIs are James P. Steinberg, MD, and Bonnie Jennings, PhD, RN. John Boyce, MD, an internationally renowned expert on hand hygiene, who recently retired from Yale University, will serve as a consultant. "We know that hospital-acquired infections are a serious public health problem for patients in the hospital but healthcare professionals are also at risk for getting infections while doing their jobs," says Casanova, an assistant professor of Environmental Health at Georgia State University. "Our research is focused on a crucial need in public health preparedness – the need to protect our health care workforce from occupational infection." Zimring, a professor in the College of Architecture at Georgia Tech, says "Putting on protective equipment requires a minimum of 21 steps, depending on the type of equipment, while also using the 'buddy system.' Mistakes due to poorly organized physical settings and processes can lead to transmission of deadly diseases to the environment, health care workers or patients. We hope to better define the design of space needed for safely donning and doffing PPE in our full-scale simulation lab." CDC has tasked the Prevention Epicenters members with developing cutting-edge science that is needed to stay ahead of the germs, for both the patients and health care providers. "To help protect Americans from infections spread in hospitals, CDC supports the Prevention Epicenter program to look for better ways to stop these preventable infections," said CDC Director Tom Frieden, MD, MPH. "Emory will play an important role in discovering how we can make hospitals and health care facilities even safer." CDC's existing Prevention Epicenters are at the following institutions: Cook County Health & Hospital System and Rush University; Duke University; Harvard Pilgrim Health Care and University of California, Irvine; University of Pennsylvania and Washington University.